Before beginning any college classes, it’s important to know what type of student you are. We’re not talking about jocks vs. non-jocks… we’re talking about the way you study and interact in the classroom. Read the following student descriptions and the problems each student faces to determine which student represents you best. 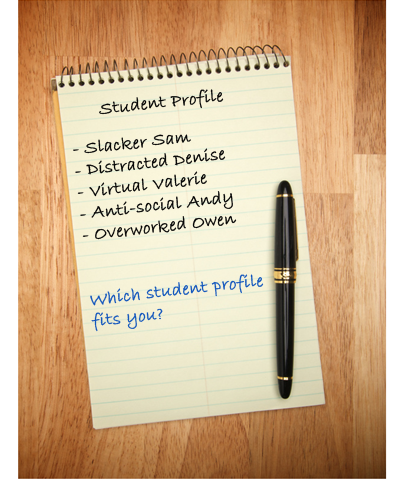 Slacker Sam - Sam is studying business and he’s very intelligent, yet his GPA is suffering. Since Sam has always been told that he’s intelligent, he doesn’t feel the need to attend the “unnecessary classes” (note: there is no such thing). Sam goes to class a few times a week and still does well on the tests. So why is his GPA so low? Well, participation is a large percent of class grades and that is where Sam lacks. Sam doesn’t like going to class and participating because sometimes he feels that he already knows what the teacher is saying. “Class is for people that need to learn, not me. I’m just here to earn my degree” is the attitude that Sam has. Not only is Sam’s GPA suffering, but when it’s time to apply to MBA programs he will have a hard time asking professors for recommendations. To them, Sam is just a name without a face. Distracted Denise- Denise goes to every class, every day. She truly enjoys her classes in photography. In the beginning of the semester Denise is very attentive, she studies a few weeks before each exam, and does pretty well on them with so much preparation. As the semester continues, Denise gets a little lazy. Although she still goes to class, her mind is in another place. Either she’s texting her friends about weekend plans or she just falls asleep in her desk. She wishes that she could maintain the same enthusiasm about school throughout the entire semester, but this seems to always be an issue for her. Virtual Valerie- Valerie has just started earning an online degree. This seemed to be a great way for her to earn a degree because she already works full-time. The problem that Valerie is facing is a lack of motivation. Sure, she has the time after work to study and interact on online message boards, but instead she takes a long bath and watches T.V. She’s starting to think that an online degree may be for a more structured student, something she’s never been much of. Anti-social Andy- Andy is a straight A student. He has never missed a day of college in his entire college career. He has a 4.0 GPA and is involved in a number of organizations. Sure, Andy has great grades and is an excellent student, but he has a hard time working with others because he is a perfectionist. When Andy is in class, he dreads hearing the words “group work” because he’d rather just work alone. Andy hopes he can overcome this struggle so that he can one day work well with others in the workplace. Overworked Owen- Owen has four daughters all under the age of 10. He thought that he’d be able to manage a full-time job and attend full-time school, but he’s starting to think again. Owen is starting to wish that he chose to earn an online degree because he misses being home with his family, and they miss him too. Owen wakes up at 6 a.m. to start working and goes directly to night class from work with no time to study. His grades are suffering, but he just can’t seem to find enough time in the day to do everything he’s supposed to do. How would you fix these students problems? Come up with methods for them to be better students. Sometimes seeing problems in someone else’s life are easier to fix than when they are your own. Use the methods you came up with to help yourself become a better student. It is important to remember that no student is perfect. Figure out where your flaws are and work on them to avoid any obstacles throughout your college career.